In 2019, Tuxedo Annie will visit the court of Blofeld in a Housatonic Recommended Mating, for many of the same reasons that we set out a year ago, before we had to switch her at the last minute to Imagining. Most interestingly, this mating will result in 8x7x5 line-breeding to Tuxedo Annie’s fourth dam, the Wheatley/Phipps foundation mare Grey Flight. 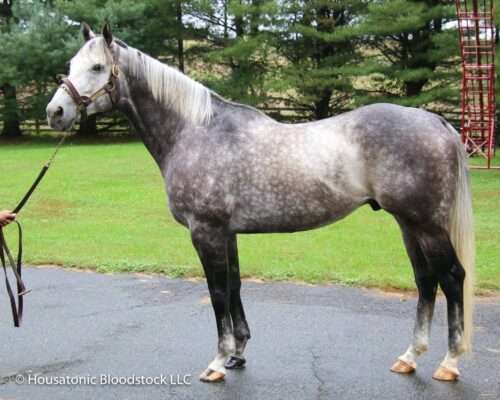 Grey Flight was a stakes winner of 12 races from 35 starts, and produced a total of nine stakes winners, including Misty Morn and her full-brother Misty Flight (both by Princequillo), who appear 4×3, respectively, in the pedigree of Blofeld’s second dam, Colonial Minstrel. Misty Morn was the best offspring of Grey Flight – she was a champion on the racetrack and a broodmare of the year in the breeding shed – while Misty Flight won the prestigious Remsen Stakes. And though their Bold Ruler half-sister, Clear Ceiling, was not a stakes winner, she is the second dam of Eclipse Champion Inside Information and Grade 1 winner Educated Risk, and the third dam of Tuxedo Annie. In addition to those three lines to Grey Flight, the foal from this mating will have traditional inbreeding to Mr. Prospector and Northern Dancer, 5×4 to both (in fact, both Blofeld and Tuxedo Annie are products of the Mr. Prospector-over-Northern Dancer cross). And, notably, there will be five crosses of Bold Ruler and six of Princequillo in this foal’s pedigree (with only two of each coming through Triple Crown winner Secretariat). As far as reasons to like this match a bit closer up in the pedigree, Tuxedo Annie has already produced a three-time winner by Limehouse, a grandson of Gone West just like Blofeld’s sire Quality Road, while her half-sister Little Bop Peep’s first foal is a stakes-placed winner at 2 by Limehouse named Thislillimeofmine. And there is a stakes winner by a son of Elusive Quality out of a mare by Miswaki (sire of Tuxedo Annie’s sire, Black Tie Affair), from a limited number of runners bred on this broader cross. Blofeld himself stood his first season at stud in 2018, and looks an even better prospect in 2019 as his sire, Quality Road, has continued to ascend the General Sire List and will stand next year for a $150,000 fee. Blofeld is from Quality Road’s first crop, and broke his maiden first-time out going 5 furlongs at Saratoga as a well-bet 2-year-old with a big reputation, before stepping straight into Graded stakes company. He overcame a troubled trip to get up gamely in the Grade 2 Futurity at Belmont in his second start, going 6 furlongs, and then stretched out to a mile and romped by five lengths in the Grade 2 Nashua at Aqueduct, closing out his juvenile campaign three-for-three. Blofeld started twice at 3, including a 3rd-place finish in the William Walker Stakes, and at 4 he returned to his best form to triumph in the Grade 2 Gulfstream Park Handicap going a mile, over the likes of Stanford and Anchor Down. He retired with four wins from 14 starts, and $745,420 in earnings. From well-cultivated Ned Evans families on both the top and bottom sides of his pedigree (he shares a fourth dam with the 2017 Horse of the Year Gun Runner, and others appearing in his female family include Horse of the Year Saint Liam), Blofeld was a $135,000 weanling, then a $275,000 yearling. Blofeld is a big, beautiful horse with plenty of length and leg, and ought to help stretch Tuxedo Annie’s foal out a bit, while also complementing the turf tendencies that her pedigree contains — even though neither Blofeld nor Quality Road won on turf, both are bred for it and Quality Road has gotten some top turf runners at stud, which is something that we specifically want in her mates.